New York: Simon and Schuster, 1969. Fine/Fine. First edition. Fine in fine dustwrapper. Warmly Inscribed by the author to poet Dan Hoffman. Publisher. Hardcover. B00BG3E394 Meets the good condition guidelines. Has loose spine/binding. Pages still intact. Has a large tear. Has wear. Five star seller - Buy with confidence! . Good. Unknown. Hardcover. B0093U9NEC . Fine. 0000-00-00. Simon and Schuster, 1969. (1st ptg.) Large, heavy, very thick book, fine blue cloth with red background to very bright gilt title and design at top front left, gilt lettering very slightly rubbed with red background on spine, 1082 pages. DJ price-clipped, beneath mylar glossy white with color design on front from flags, b/w photo of author on back. DJ has two microtears at spine top edge. Near Very Fine DJ/Very Fine book.. 1st Ptg.. Cloth. Fine/Near Very Fine. New York: Simon & Schuster. 1969. Hardcover. 0671203371 . Near Fine in a Very Good+ dust jacket. Soiling to front and rear panels. Edge wear. Clean, bright pages. ; 9.20 X 6.30 X 2.30 inches; 1084 pages; Original unclipped dust jacket protected by archival Brodart cover. All domestic orders shipped protected in a Box. .
1971-06-04. Good. Ships with Tracking Number! INTERNATIONAL WORLDWIDE Shipping available. May not contain Access Codes or Supplements. May be ex-library. Shipping & Handling by region. Buy with confidence, excellent customer service! Simon & Schuster, 1969-11-13. Hardcover. Used:Good. New York: Simon and Schuster, 1969. 1st Edition 1st Printing. Hardcover. As New/As New. New York: Simon and Schuster, 1969. First Edition. First Printing. SIGNED by the author, William L. Shirer. Mint in blue cloth, front board and spine stamped in red and brightly gilt. In near Mint pictorial dust jacket. Illustrated with maps. With First Edition Signed bookmark laid-in. Large octavo, very thick. Hardcover. Da Capo Press, 1994-03-21. Paperback. Used:Good. Da Capo Press. PAPERBACK. 0306805626 New Condition. . New. Da Capo Press. PAPERBACK. 0306805626 Like New Condition. . Fine. 2008-05-05. Good. Ships with Tracking Number! INTERNATIONAL WORLDWIDE Shipping available. May not contain Access Codes or Supplements. May be ex-library. Shipping & Handling by region. Buy with confidence, excellent customer service! New York: Simon & Schuster. 1969. Book of the Month Club Edition. Hardcover. Very Good in a Good dust jacket. Shelf wear to panels. Chip to lower front panel. Creasing to crown. ; 8vo 8" - 9" tall; Original unclipped dust jacket protected by archival Brodart cover. All domestic orders shipped protected in a Box. .
Da Capo Press. PAPERBACK. 0306805626 . New. Simon & Schuster, 1969. Hardcover. Near Fine/Very Good. Signed by author. Jacket shows signs of shelf wear and edging. Great book for its age. Simon & Schuster. Hardcover. 0671203371 New Condition. . New. New York: Simon & Schuster. 1969. First Edition; Second Printing. Hardcover. 0671203371 . Near Fine in a Very Good+ dust jacket. Edge wear. ; 9.40 X 6.20 X 2 inches; 1084 pages; Original unclipped dust jacket protected by archival Brodart cover. All domestic orders shipped protected in a Box. .
New York : Simon and Schuster, 1969. First Edition, Second Printing. Very good cloth copy in a near-fine, very slightly edge-nicked and dust-dulled dust-wrapper, now mylar-sleeved. Remains particularly and surprisingly well-preserved overall; tight, bright, clean and strong.. Physical description; 1082 p. : maps ; 25 cm. Subject; France  History  1914-1940. New York: Simon and Schuster. 1969. First Edition; First Printing. Hardcover. Very Good+ in boards. Rear panel slightly scuffed. Some wear to spine's heel. Slightly bumped corners. No DJ. ; 8vo 8" - 9" tall; All domestic orders shipped protected in a Box. .
New York: Simon & Schuster. Fine in Very Good dust jacket. (1969). First Edition; First Printing. Hardcover. 0671203371 . Dark blue cloth cover with red inset containing the title in gilt letters on both the front cover and spine. Pages clean and unmarked. Binding sound. DJ is in mylar and has light wear at tail of spine and corners and a short tear at head of spine.. Small gold bookstore sticker on the inside front DJ flap. Not price clipped. Price on DJ is $12.95. DJ in mylar. Not a remainder. ; 8vo 8" - 9" tall; 1084 pages . Simon and Schuster, 1969. 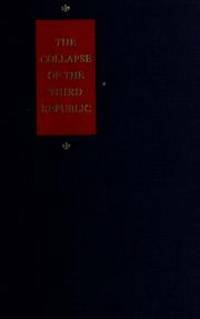 Large, heavy book, fine dark blue cloth, red background for bright gilt title and designs at top front left, all bright and very fine on spine too, red inside covers and adjacent end papers, 1082 pages. DJ beneath mylar, white with flag decoration on front, b/w photo of Shirer on back. DJ and book, both Very Fine.. Cloth. Fine/Very Fine. New York: Simon and Schuster, 1969. Book Club (BCE/BOMC) . Hardcover. Near Fine/Very Good. 8vo - over 7¾" - 9¾" tall. Fine blue cloth. Very good white price-clipped DJ. Some wear and tear, chipped spine extremities, tanned spine of DJ. (1969), 8vo, 1082pp. New York, NY, U.S.A.: Simon and Shuster, 1969. 1st Edition. Hardcover. Fine/Near Fine. An Inquiry into the Fall of the France in 1940. New York: Simon and Schuster, 1969. First Printing. good. 1082, notes, bibliography, index, ink notation inside front board, stamp inside front flyleaf, water stain on front board. New York: Simon and Schuster, 1969. Second Printing. very good, good. 1082, notes, bibliography, index, DJ slightly soiled and small tears. Simon & Schuster. Hardcover. 0671203371 Like New Condition. . Fine. Simon and Schuster Publishers-, 1969. Hardcover dj/ pub.1969/ Fair conition/1082 pages- An inquiry into the fall of France in 1940. (E23174). Hard Cover. Good. New York: Simon & Schuster, 1969. WYSIWYG pricing--no added shipping charge for standard shipping within USA. Blue cloth, title stamped in gold on red ground, top edge dyed orange, orange endpapers, 1082 pp, maps, notes, bibliography, index. Spine abraded with numerous small tears in the main title area, otherwise about fine. DJ in Brodart archival cover. Shipping weight 4 lbs.. 2nd ptg. . Good/Near Fine. 24 X 16½ cm. The Collapse of the Third Republic. Simon & Schuster, 1969. First edition, first printing. Fine in near fine dust jacket, in mylar cover. Condition: Fine in near fine dust jacket, in mylar cover. New York: Simon & Schuster. 1969. First Edition; First Printing. Hardcover. Very Good in a Very Good price clipped dust jacket. Two small tears to front jacket and very minor chew marks to top right corner. Stated First Printing. ; 8vo 8" - 9" tall; On Sale! . Da Capo Press, 1994-03-21. Paperback. Good. London:London:: Heinemann,. 1970. F 1st Edition. Book. H Binding is Hardcover.. Very Good. in Fair dj. Purple boards, 1045pp. Exhaustive history of France's Third Republic (1870- 1940) and the reasons it fell at the beginning of WWII. The author was a reporter in Europein the 1930's and witnessed many of the events he writes about here. Clean, tight, sound copy. Minor exterior wear. Dustjacket missing pieces on front, back, and spine; slightly faded on spine. First British Edition, Binding is Hard Cover. 8vo - over 7_" - 9_" tall. New York, New York: Simon & Schuster, 1969 Book. Good +. Hardcover. Good + hardcover in good - dustjacket. May be some rubbing and bumping to edges and corners of book. May be some rubbing, chipping and large tears to edges, corners and spine of dustjacket. Overall a good reading copy only. All hardcovers are shipped in protective Demco mylar..
New York: Simon and Schuster, 1969. Book Club Edition. good, fair. 1082, notes, bibliography, index, DJ soiled, stained, and small tears, piece missing at top of DJ spine. New York: Simon and Schuster, 1969. First Edition, First printing. Hard Cover. Stated first printing. FINE BOOK - CLEAN, TIGHT , BRIGHT IN NEAR-FINE DUST JACKET WITH ORIGINAL $12.50 PRICE, AND SMALL PRICE LABEL ON FRONT FLAP. DISCREET OWNER NAMES. Uncommon this nice. NY: Simon & Schuster, 1969. First Edition, First Printing; dj w/lite chipping, unclipped price; 1082 clean, unmarked pages...will not fit in priority envelope. 1st. Hardcover. Very Good/Very Good. Illus. by B/w. 8vo. New York: Simon and Schuster, 1969. 1st Edition . Hardcover. Very Good. 8vo - over 7¾ - 9¾" tall. Very Good condition. First edition, first printing. No internal markings of any kind. Simon & Schuster, 1969-11-13. Hardcover. Very Good/Missing. Excellent condition. Interior is tight, bright and clean. Missing original paper dust cover. Minor scuffing on the hardcovers from shelf wear. Not a gift book but a wonderful reading copy. Cup stain on the front cover. 100% Satisfaction Guaranteed. All items are carefully enclosed with bubble wrap. We ship promptly and worldwide via US Post and will email you a tracking number.